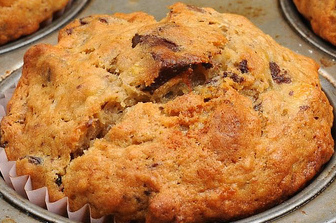 These healthy vegan banana muffins are just perfect for a special breakfast. They are quick and easy to prepare and fill up the house with a great cinnamon and vanilla aroma. Place the raisins in a cup and cover with hot water. Let to stand for a few minutes to plump and then drain excess water from raisins. Chop bananas into small pieces. In a bowl, stir together the whole wheat flour, oatmeal, baking powder, baking soda, cinnamon, nutmeg and ground almond flour. Add oil, vanilla extract, coconut milk, maple syrup or stevia and raisins. Mix together using a wooden spoon. Place in oven and bake for 20-25 minutes until the muffins have browned and a toothpick comes out clean when inserted into the middle. Remove from oven and allow to cool in the pan before removing from cups.